First things first! Who doesn’t love cheese? and if you’re allergic to dairy, moment of silence, because these things are fluffy little balls of heaven. They’re easy to make and the best part is you can make them ahead of time and they hold over well at room temperature. Not to mention, you. can. freeze them. Yaaay! you can make them in bulk and when that unexpected guest comes over who raves about how good you cook. You can pull them out of the freezer and throw them in the oven. Instant entertaining snack with the accompaniment of some butter cubes, pepper jelly or even preserves. You’re Welcome! 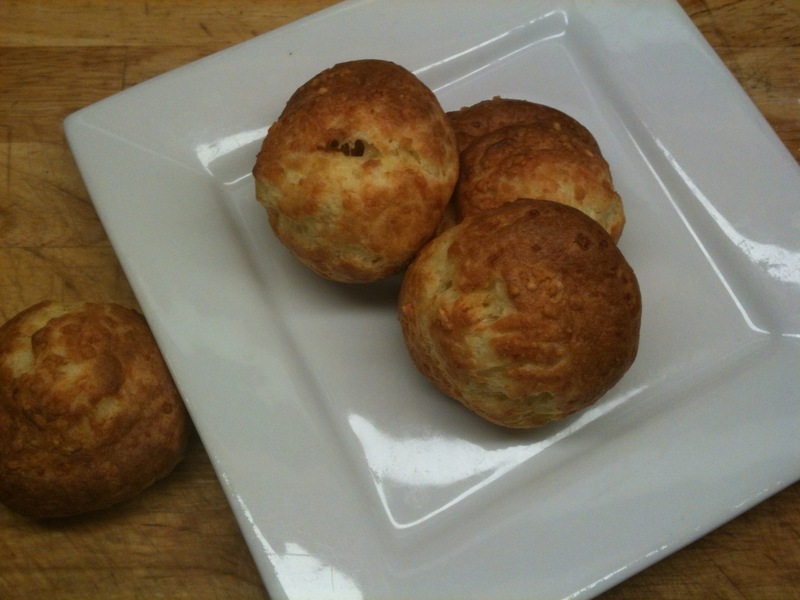 I was looking for a quick snack to prepare one day for family meal, as mentioned here, and came across these gougeres from the man himself, Alain Ducasse. The world renown French Chef with the esteemed Benoit Restaurant in New York and Le Ralaiz in Paris. There are a few changes I made which didn’t affect the outcome in the least bit. I used Pecorino Romano as opposed to Gruyere, and there’s the addition of white pepper instead of fresh ground. The man knows food in a way that most will only aspire to. And I assure you that once these come out the oven. You will be reluctant to share. Preheat the oven to 400°. Line 2 baking sheets with parchment paper. In a medium saucepan, combine the water, milk, butter and salt and bring to a boil. Add the flour and stir it in with a wooden spoon until a smooth dough forms; stir over low heat until it dries out and pulls away from the pan, about 2 minutes. Don’t fret, you’ll know when it’s ready. Scrape the dough into a large bowl; let cool for 1 minute. Beat the eggs into the dough, one at a time, beating thoroughly between each one. Add the cheese and a smidgen each of pepper and nutmeg. Transfer the dough to a pastry bag fitted with a 1/2-inch round tip and pipe tablespoon-size mounds onto the baking sheets, 2 inches apart, or dollop in spoonfuls for a more rustic shaped gougère. Sprinkle with cheese and bake for 22 minutes, or until puffed and golden brown. Serve hot, or let cool and refrigerate or freeze. Reheat in a 350° oven until hot. Notes. When making the choux pastry, it is important to be sure that each egg is fully incorporated into the batter before adding the next. Don’t worry if the batter separates and looks curdled at first. Keep beating, and it will come together nicely. We filled them with a simple chicken salad that I prepared. Only consisting of baked chicken breasts, grape tomatoes, red onion, celery salt, white pepper and mayo. Freezing Instructions: After baking, allow them to cool. Spread the gougères out on a baking sheet, cover the sheet with plastic wrap and freeze them until they are firm. Then store them in plastic bags for up to 6 months. This entry was posted in: Appetizers, Cook with Me! True story: in San Francisco a bakery with no name sells gougeres that are as big as fists. The secret ingredient, aside from the goodness of gruyere, is thyme. Oh my. If you’re ever in SF, it is a must visit. That said, Alain Ducasse is the man and I imagine his gruyeres to be as delectable as you describe them to be. I love making foods that you can make now and pull out of the freezer later for a quick eat. Great post!